BACKGROUND: Indications and outcomes following abdominal wall reconstruction (AWR) are variable based on a variety of factors. Patient factors include hernia stage and co-morbidities, while surgeon factors include the method of hernia repair. Various strategies have been devised to improve outcomes in the intermediate and high risk patients that include specific operative techniques and biologic materials. The purpose of this study is to analyze the performance of a porcine acellular dermal matrix (Strattice) in a subset of patients who are at increased risk for peri-operative complications. STUDY DESIGN: The authors reviewed all patients that had complex AWR with Strattice underlay/reinforcement from 2007-2010. Intermediate risk patients were defined as having multiple co-morbidities without abdominal infection. Strattice was used as an underlay graft in all patients. RESULTS: Strattice was used in 69 patients of which 41 met the inclusion criteria. Average patient age was 60 years and the average BMI was 35.5. Co-morbidities included coronary artery disease (63.4%), diabetes mellitus (36.6%), and COPD (17.1%). A recurrent hernia was present in 78%. Mean defect diameter was 13.7cm. Fascial closure was achieved with/without component separation in 40/41 (97.6%) patients. Panniculectomy was performed in 6/41 (14.6%). Average hospitalization was 6.4 days (range 1-24 days). Complications included seroma (3/41; 7.3%), wound dehiscence/skin breakdown with Strattice exposure (2/41; 4.9%), cellulitis (1/41; 2.4%), and hematoma (1/41; 2.4%). Strattice removal was not required in any patients. Two patients had medical-related complications requiring intervention. 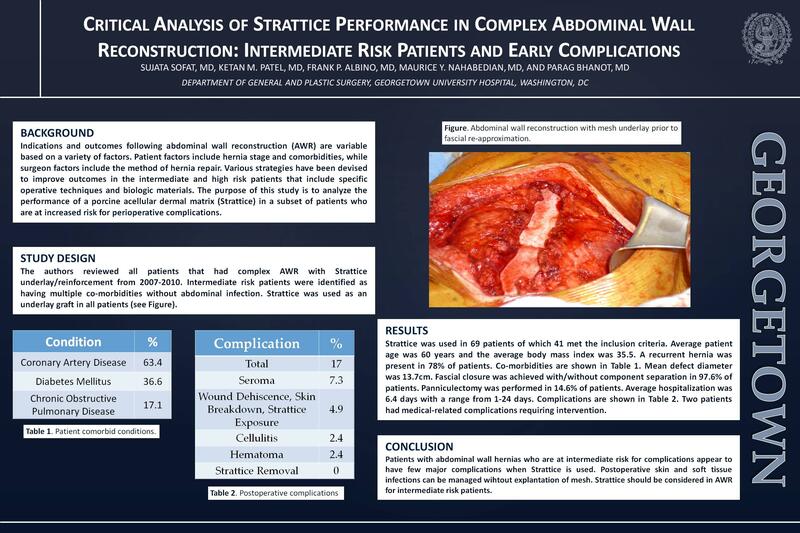 CONCLUSIONS: Patients with abdominal hernias who are at intermediate risk for complications appear to have fewer complications when Strattice is used. Post-operative skin and soft tissue infections can be managed without explantation of mesh. Strattice should be considered in AWR for intermediate risk patients.